Click here to view a full res version of MOC2_163a. 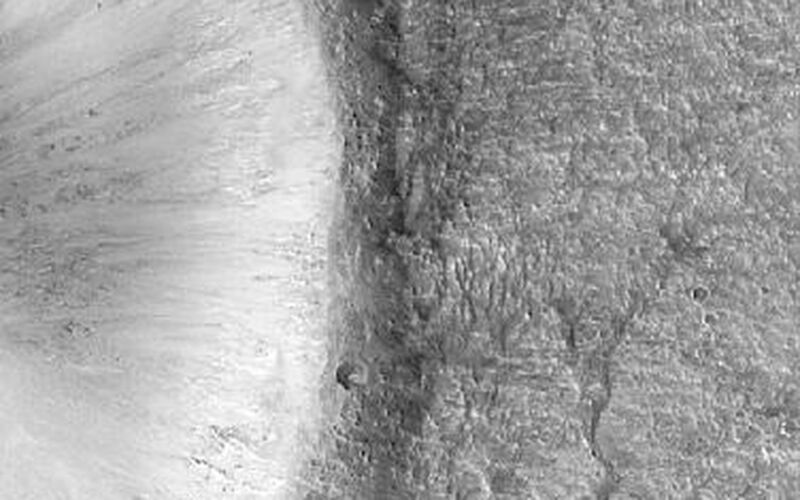 This pair of Mars Global Surveyor (MGS) Mars Orbiter Camera (MOC) images shows the eastern third of a 4 kilometer-diameter impact crater located in Acidalia Planitia. The picture on the left is a MOC red wide angle camera context frame. It was taken at the same time as the narrow angle (i.e., high-resolution) camera image (right). Impact craters form by the sudden release of energy when an asteroid slams into a planet's surface at many miles per second. 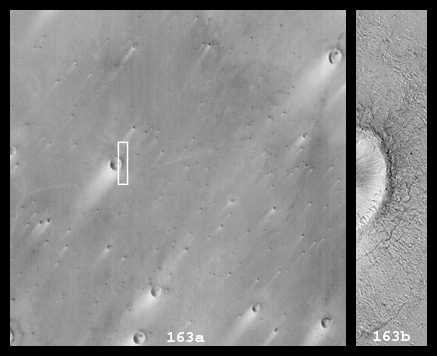 The high resolution MOC view (right) shows the walls, raised rim, and ejecta material thrown out of the crater during this blast. Similar features are seen at the famous Meteor Crater in northern Arizona, U.S.A.--except that this martian example is about 4 times larger than the one in North America. 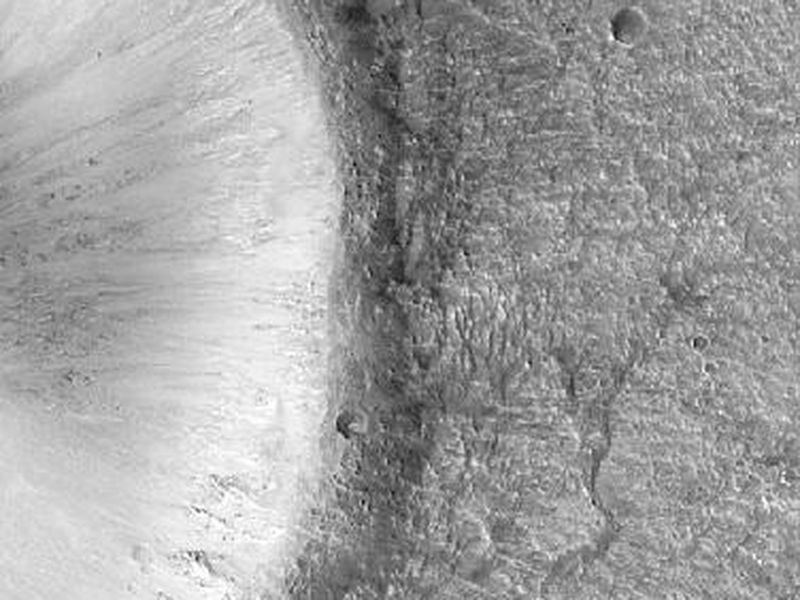 In this example, faint radial and concentric ridges and cracks in the crater ejecta are believed to arise from the motion of ejected material in a manner similar to thick pancake batter flowing across the surface. 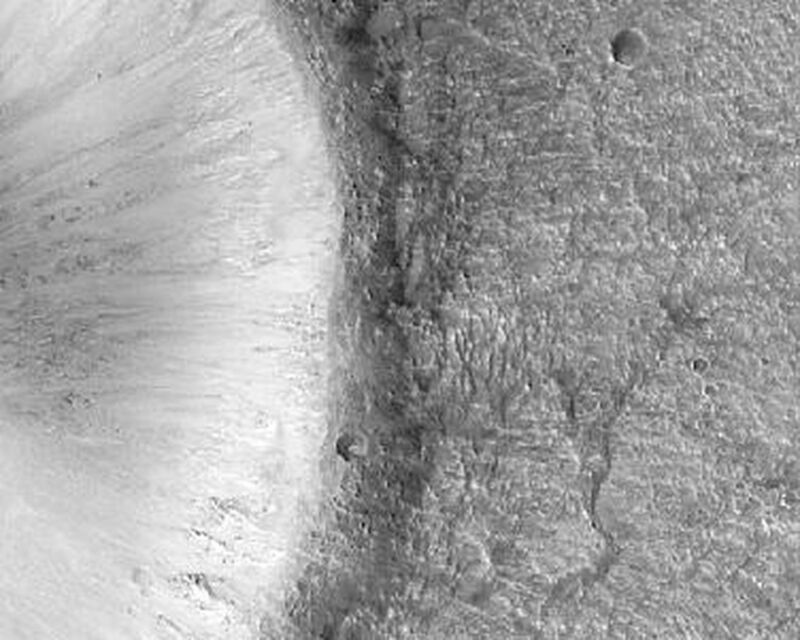 The wide angle view (left) shows that many of the craters in Acidalia Planitia have a bright streak formed by wind transport of dust or sand. 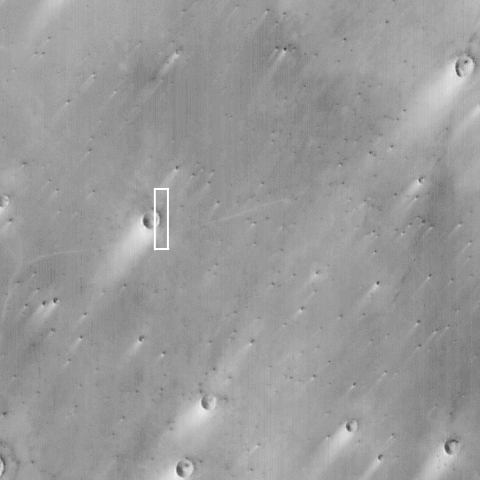 The narrow angle image (right) covers the full field of view of the MOC narrow angle camera -- i.e., an area that is 3 kilometers (1.9 miles) wide. Both images are illuminated from the left/lower left. The images were acquired on July 15, 1999. The crater is located at 34.3°N latitude, 42.9°W longitude.